When you arrive at Silverside Farm 40 acres of Cowichan Valley beauty rise up to meet you, and that’s before you pick a few blueberries from the over 30-year-old vines. Established in 1982, Silverside was originally a mixed farm. Berry production began in 1988, and the winery opened in December 2005. With the berries and related jams, jellies and syrups being such a hit the focus again is on the farm and the winery portion was closed late 2017. Since 2009, with the vision and passion of Don and Lyn Bull, Silverside Farm has grown as a boutique operation, and has become a Vancouver Island tour destination, community event venue, and most of all, an experience of the best nature has to offer—expansive views, the sights and sounds of wildlife, and sun-ripened fruit picked from the vine. While the farm produces thousands of pounds of fresh blueberries each year, Silverside had been known for its specialty wines and fortified (port-style) dessert wines made from its very own tayberries, as well as locally grown raspberries and blackberries. Truly unique, Silverside’s tayberry wine won the double gold medal at the All-Canadian Wine Championship four years in a row from 2012-2015. Tayberries, a cross between a raspberry and blackberry, produce a slightly tart berry and a delicious wine. Seasonally our store is open on site so you can also check out Silverside jams, jellies, and syrups made right on the farm by the Bulls’ daughter, Lindsey. On warmer days, you might prefer your berries served up in the farm’s famous frozen yogurt with waffle cones handmade in the Cowichan Valley. If your boutique tastes include local art, Silverside also showcases a wide array of original paintings, photography, and hand-painted glassware by area artists. Whether it’s supporting local artists, neighbouring producers, or the 25 First Nations people Silverside employs to hand-pick its berries, Don and Lyn realize that “it takes a village” to raise a thriving farm and business, and giving back to the community is important to them. The Bulls purchased Silverside after a trip to Africa, where they witnessed how happy and grounded the people seemed to be “hunting and gathering” and growing their own food. 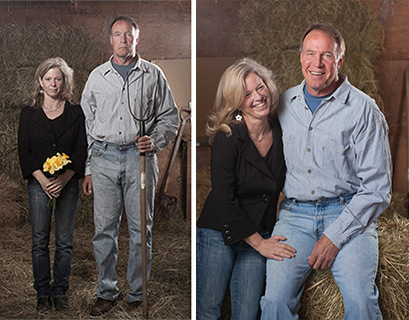 Inspired to return to the land and simpler living, they took the leap and decided to try life on the farm. Neither of them had any farming experience though Lyn’s father owned a small farm in Alberta where she grew up visiting there on weekends. Don, who still works as a financial advisor, still makes plenty of time for the farm. He can be found running the tractor or tending to the vines and other farm maintenance. Meanwhile Lyn, when not working in the seasonal store, is usually planning outdoor events such as intimate jazz concerts under the stars, or a sprawling open-air vintage market that includes 35 artisans and draws about 1300 people to the farm. 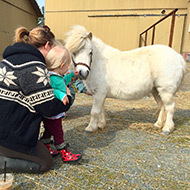 In addition to managing Silverside’s retail and marketing operations she takes care of two miniature ponies, two horses, a German shepherd named Parker and a very fluffy cat called Murphy. 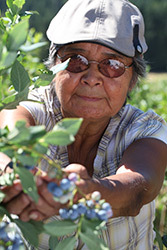 A landmark property that sits at the southern reaches of the Cowichan Valley, Silverside Farm produces thousands of pounds of fresh, sweet blueberries each year. Welcoming visitors, from age two years old to 92 years old, to pick their blueberries, pick apples from the tree, pet the ponies, or simply relax and reconnect to the simple pleasures of nature is what makes Silverside a truly fresh experience.